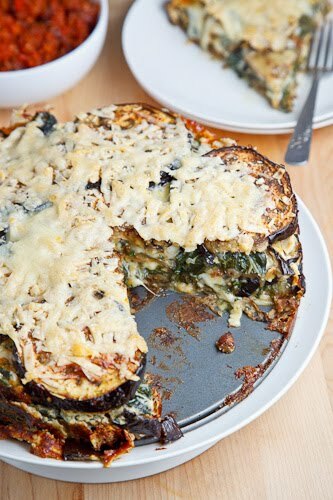 A rustic crustless pie with layers of eggplant, swiss chard and cheese that makes a great light meal when topped with a tasty marinara sauce and served with a salad. With the weather cooling off a bit I do not mind having the oven on as much which opens the doors to a lot more recipes. 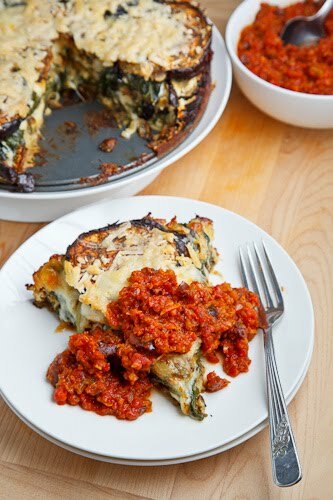 This is good because there are a few of them that have been building up on my to try list and the first one on that list was this recipe for an eggplant tortino that I came across in a recent Food & Drink magazine. I am a big fan of eggplant but it had been a while since I last did something with it and the idea of using it in a savoury pie stacked in layers along with swiss chard and plenty of cheese sounded really good! One of the things that I like about this recipe is that the eggplant is roasted which helps to ensure that it is nice and tender in addition to bringing out its natural flavour. Another great thing about this recipe is that it uses no less than three kinds of cheese including provolone, which is melted into the creamy swiss chard layer, fresh mozzarella, which is stacked in the pie, and parmigiano reggiano (parmesan) which on sprinkled on top to melt while it bakes. I served this eggplant tortino topped with my favourite marinara sauce to which I added some chopped kalamata olives for an extra hit of flavour. Lightly brush both sides of the eggplant with oil, place them on a baking sheet in a single layer and season with salt and pepper. Bake in a preheated 400F/200C oven unto tender and just browning on the top, about 15-20 minutes and set aside to cool. Add the garlic, red pepper flakes and swiss chard and saute until the swiss chard has wilted, about 2 minutes. Mix in the cream, bring to a boil, remove from heat and mix in the provolone until it melts. Let the chard cool and mix in the eggs. Cover the bottom of a greased spring form pan with 1/3 of the eggplant followed by 1/2 of the swiss chard mixture, 1/2 of the mozzarella, 1/3 of the eggplant, the remaining swiss chard mixture, the remaining mozzarella, the remaining eggplant and finally the parmigiano reggiano. Bake in a preheated 400F/200C oven until the top is golden brown and the sides are bubbling, about 25-35 minutes. Serve topped with marinara sauce. Tip: Eggplant can be a bit on the bitter side and if you do not want this you can sprinkle the slices with salt and let them sit in a colander for 20-30 minutes before rinsing them, patting them dry and using them in the recipe. Pinning this one – it looks amazing! Love eggplants this way…looks so delicious!! Extremely scrumptious looking and sounding! This is so unique and yummy looking! Given my intense love of eggplant, I can't really think of anything I want more right now! Sounds like a wonderful recipe! You always have something interesting and delicious! This sounds wonderful! I think this might be thing first thing I make on Friday after my new oven is installed. It will have been broken for 15 days! Not ok! This looks delicious! I am the same way with the oven. If it's cool outside, I am happy to cook with it. If it's not, it stays off! This looks fabulous! My veggie-hating husband won't go for it, but I think my vegetarian sister (and for that matter, my other 2 sisters) will adore it, as would I! Thanks. I like that this has chard in it, too. I bet it's delicious. Love the olives in the sauce as well. Oh my goodness this looks and sounds unbeatable! I am a great fan of eggplant so I thank you!! Hi Kevin. This looks divine, but I've never cooked with eggplant. You said to brush each side of the sliced eggplant. Brush it with what? Help is needed for this novice. Thanks. Gay Armstrong Moritz: You brush the eggplant with the oil. I have updated the recipe. Thanks! YIKES! I tried to make this today, and the chard/egg mixture was very liquid, and ran out of the springform pan. What can I do to correct this problem? Cindy: You can put a layer of parchment paper on the inside that comes just a little bit up the sides. I also like to put a baking sheet on a rack below where I am baking anything, just in case what I am baking leaks or boils over. I did that, and ended up with a mess of scrambled egg on the cookie sheet under the springform pan… I take it you didn't have this problem. Your tortino looks like it has height and egg in the chard layers. ive read alot of blogs in my time- and yours is by FAR by best!! no food politics, snobbery going on here and amazing photos and flavour combinations just right, you hit the nail on the head keep up the great work! It's in the oven now. Lined the pan with foil but I will still need to hose out the refridgerator. It smells really good. I hope somebody invents cullinary duct tape to help with the leakage.